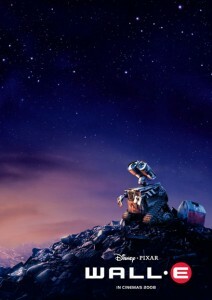 I thought this was brilliant, I absolutlely loved WALL*E. I can’t remember the last time I was this delighted by a movie. The story of a little robot left behind on Earth to clean up our trash is romantic, heroic, heartbreaking, and visionary all at the same time. It really is a wonderful movie, not just a wonderful kids’ movie. Pixar consistently impresses me with the quality of not just their animation but their storytelling as well. WALL*E lives a lonely existence collecting trash and little interesting objects, and he spends his free time watching Hello Dolly! and dreaming of a partner to hold hands with. Then EVE lands on a research mission, and the story unfolds as WALL*E tries to gain her affection and then protect her, leading to a voyage to space and the revelation of what the human race has become. Very big messages in a charming little movie that had me blubbering the last twenty minutes. WALL*E is the most clever and human (with robots!) story I’ve seen in a long time. I was really taken with it.